John Northall has provided us with these additional high quality photographs and comments to supplement our main Degannwy Castle page. 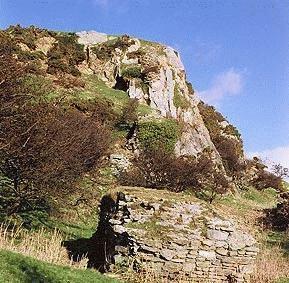 Mr. Northall has also provided the site with a series of his own sketches detailing how Degannwy may once have appeared, based on his own research at Degannwy and at other Welsh castles. 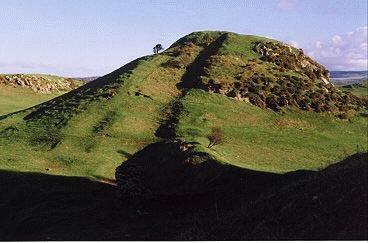 The upstanding remains of the bailey's northern gate was covered by the high ground of the western hill above it. The masonary has a large drawbar hole in it that can be seen in the photograph as a rectangular slot running along the length of the wall. This shows that there must have been a doorway which opened at right angles to the line of the bailey wall. It may have been an entrance to a guardroom or an unusual main entrance similar to that seen at Pembroke Castle. This shows the remains of the large 40 ft diameter tower which flanked the first gateway to the inner bailey on the west (main) hill. If you look carefully, the remains of a fine roll moulding can be seen 3 courses up on the left hand end of the curved section. The remains of 3 adjoining wall can also be seen - the one nearest the camera runs down to the gateway. 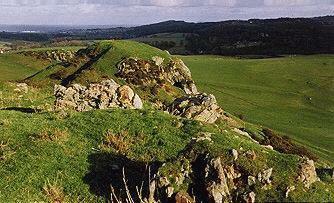 The well scarped east hill demonstrates the strength of the outer area of the castle. Mansell's tower once stood on the top of the hill with its apsidal end pointing towards the left of the picture. The remains of the barrier ordered by King Henry the Third in 1250 can be seen as the level area just below the top of the hill where the small tree is standing. 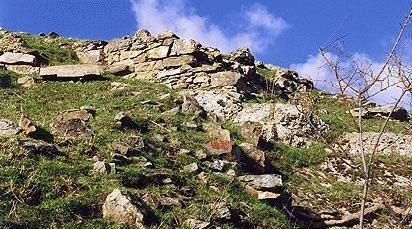 The remains of walling running up the south side of the smaller east hill can be seen perched on the cliff face. 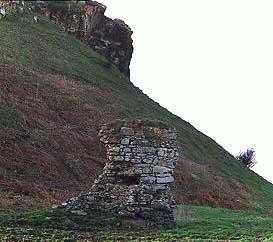 There was a 12 ft square tower at the base of the cliff and a turret at the top. The large lump of masonary in the foreground has fallen forwards from the lower bailey gatehouse or adjoining wall and seems to lie upside down. Looking across to the east hill from the site of the Kings Hall at the highest point of the west hill, the northern coast can be seen in the background. The castle had panoramic views in all directions. The line of the northern bailey wall can be seen climbing the east hill to where it joined the side of Mansells tower. The imprint of the towerwalls can just be made out on top of the small hill while the substantial amount of fallen masonary in the foreground awaits excavation.